The Mass Actions block allows instructors to perform actions on multiple items in a course rather than having to do repeated actions on individual items. To use this block, Java Script must be enabled in your browser. 2. Click the Edit button in the top right-hand corner of your course. 3. 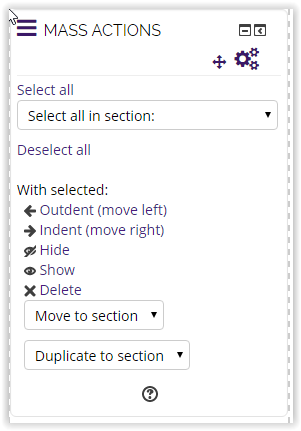 From the Add a Block dropdown menu, select Mass Actions. 4. The Mass Actions block should appear. 5. To perform actions on multiple items, click the check box on the right of the items in your course. 6. Then select the action you would like to perform in the Mass Actions block. For more information on Mass Actions block, please see article #18518.